In this month of October, Zuan Yuan Restaurant in One World Hotel has prepared a special “I Love Hong Kong” promotion menu featuring none other than… Hong Kong food! 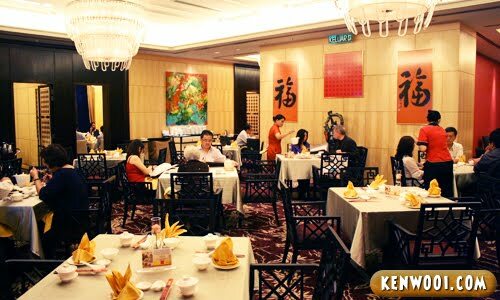 Known as the culinary capital of Asia, Hong Kong offers food lovers great dishes. And since I’ve never been to Hong Kong, yet, I was really looking forward to the food. Located at the pathway connecting 1 Utama and One World Hotel’s lobby, Zuan Yuan is one beautifully furnished restaurant – for instance, look at the chandeliers. Anyway, without further ado, let’s proceed to the dishes from Zuan Yuan’s I Love Hong Kong menu – starting with the unique appetizers. First, the Poached Bitter Cucumber “Sze Chuan” Style (RM12). The name itself is self-explanatory – bitter, yes it is. Also known as bitter gourd, some may enjoy the bitterness but I personally don’t fancy that. 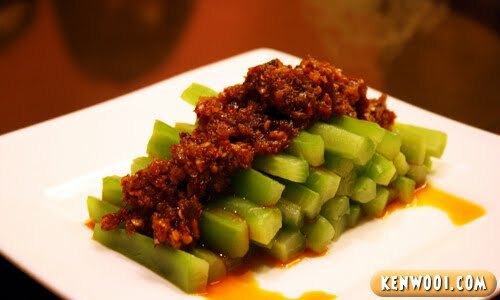 However, having it with some Sze Chuan chili paste could cover the bitterness and spice things up. Next up, another appetizer, is the Sea Conch with Cucumber in Wasabi Sauce (RM18). 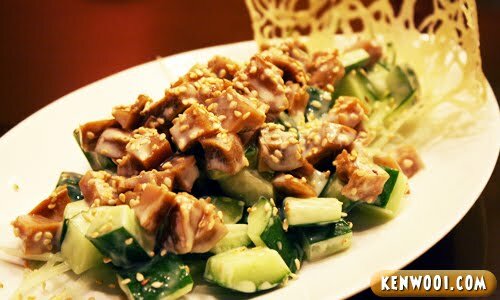 Being one of the chef’s creative specialties, this cold dish is filled with texture as it’s a mixture of the chewy sea conch, crunchy sliced cucumbers and sprinkled with sesame seeds. Yes, “Wasabi” is stated on the dish’s name, but it’s very light – barely noticeable. Next is the Double Boiled Black Chicken Soup with Dried Scallop (RM20). 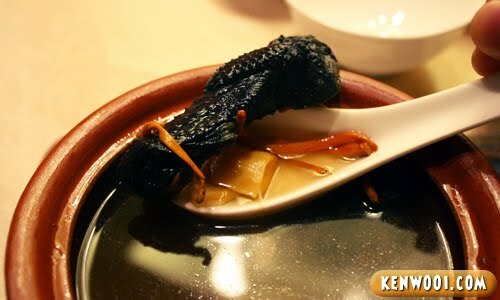 The broth is soothing and the black chicken tastes good. Alright, on to the main courses. The first main course is the Wok Fried Tiger Prawn with Special Sauce (RM28). Accompanied by the bright yellow sauce, this huge prawn is very well-presented. 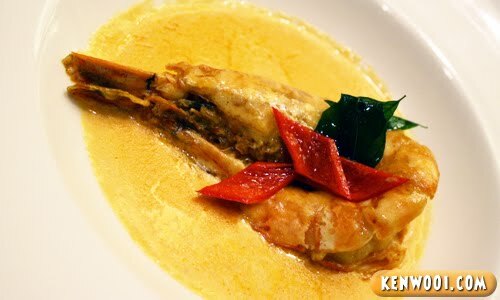 The prawn meat is delicate and succulent, and the creamy special sauce is simply flavorful. 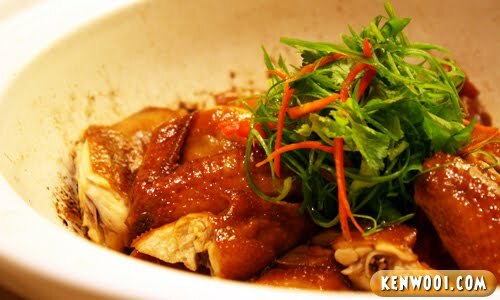 The Braised Chicken with King Soya Sauce (RM20 per ½ bird) comes next. A typical dish you might say, but this chicken meat probably a class-higher than the ones we usually eat. The meat is cooked exceptionally well and it emits a delightful smell. 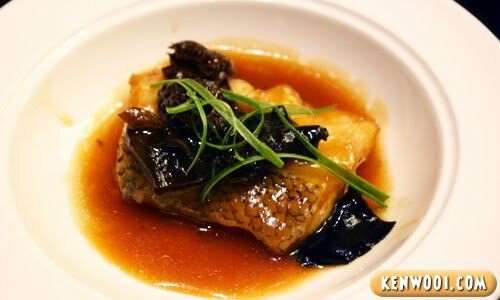 This has got to be my favourite, the Braised Cod Fish with Morel Mushroom (RM32). Delicate, tender and tasty are possible descriptions of this fishy dish. The morel mushroom provides a texture variation, and not forgetting the irresistible gravy. Simply delicious, I like! In fact, I love cod fish. Next up, Braised Bean Curd with Egg and Tomato Sauce (RM22). 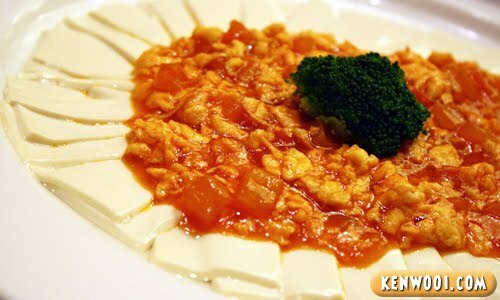 Prepared with pieces of sliced bean curd and topped with tomato egg sauce, this dish is quite ordinary. The bean curd tastes plain and has to be eaten with the tomato sauce. By the way, the tomato sauce actually tastes similar to the home-cooked ones prepared with canned baked bean in tomato sauce. 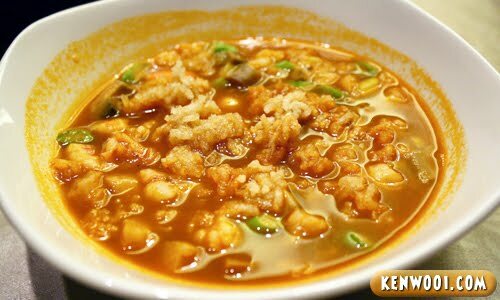 The last main course is Assorted Diced Sea Food with Crispy Rice in Lobster Soup (RM13). Looks like baby food, I know. Surprisingly, this assortment of ingredients, plus the crispy rice creates a pleasurable texture, warmth and savoriness. Once done with the main courses, it’s time for desserts! First one is the Black and White Sesame Glutinous Rice Cake (RM12). Despite its dull colours, this Michael Jackson black and white layered cake (kek lapis) turns out to be a tasty delicacy. 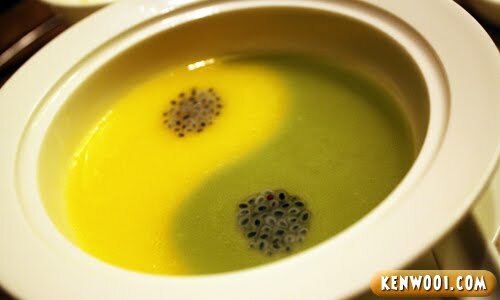 And finally, best for the last, the Mango and Avocado “Ying Yang” Style (RM12). This creatively and skillfully prepared dessert tastes ordinary if each flavour is individually eaten. But when it’s stirred, the mixture becomes a fantastic one – sweet and delectable! 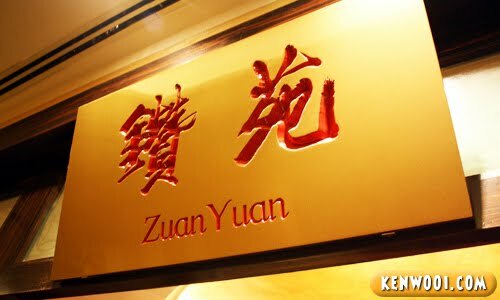 So yeah, if you’re feeling like eating some classic Hong Kong food, express your “I Love Hong Kong” emotions by celebrating the best of Hong Kong at Zuan Yuan, One World Hotel this October 2011. 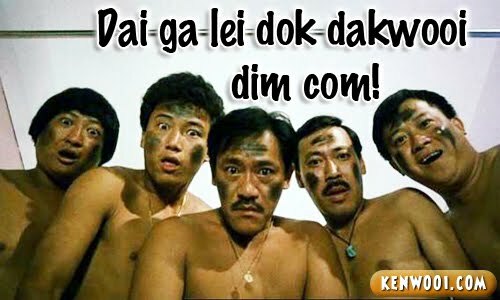 Ken is “Dak” in Cantonese, just so you know. 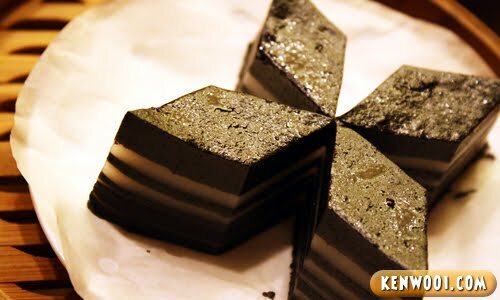 Black and White Sesame Glutinous Rice Cake!!!!!!!! The “Michael Jackson” looks tasty! looks halal, is it halal bro? dont mind trying if it is…. Zuan Yuan is a pork-free restaurant. Chinese Food is always the Best.. ho ho ho.. Back in Sabah,Chinese Restaurant is my favourite.. But it’s hard to find any here at Shah Alam.. ho ho ho.. wei,bring me some food la man.. I’m hungry!! bro you work nearby one world hotel??? ME TOO!! Lei zan hai dak la. I miss the Assorted Diced Sea Food with Crispy Rice in Lobster Soup . Its a strange looking (baby food) dish but is nevertheless very yummy. Love the crisp and flavourful rice. Ken = Can = Dak? LOLL! wah!this is testing my taste buds. black chicken soup is one of my all time favs! luv the Prawns with Special Sauce (especially the sauce!!) and Braised Chicken…. yum yum! !